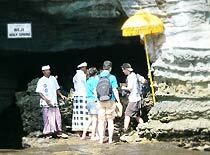 Explore the Deep Bali in the Private Tour! 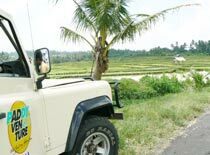 Bali Activity Paddy Land Rover Tour by an activity company in West Bali, brings you a great opportunity to experience the nature and traditional life in Bali. 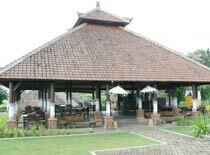 You will drive up to Jatiluwih in the northern area after visiting Tanah Lot Temple and a tile factory. Request as many stops as you want for photo shooting during the tour ! 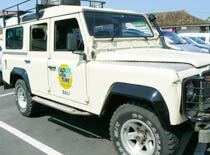 * The tour will be by private paddy land rover. 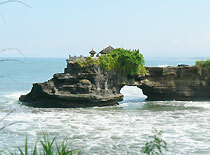 * The admission fee for Tanah Lot Temple is included but not the offering. * Making stops on the way is not accepted same with other activity tours. 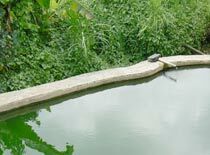 ・Visit Batu Bolong and the garden. you can walk to the front of the temple in the low tide to have baptism. 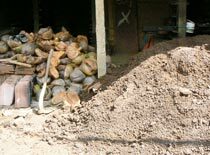 ・The village has natural clay which is a material for tiles. You can watch the process of making a tile. 13：30～14：30 Arriving at restaurant near Jati Lui. * The pick-up time will be final in booking. The tour is about from 8:00 to 16:00. 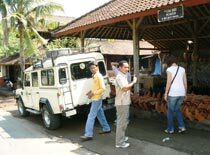 11：20～13：30 Driving to the north from Pejaten Village and going through the many villages, jungle and rice terraces. * Visiting hot spring might be skipped in the tour of Land Rover + ATV due to the time schedule. * For children (Age 5-12) does not cover for insurance. Please join with parents. * You will get wet and dirty in ATV Ride , please bring change of the clothes. 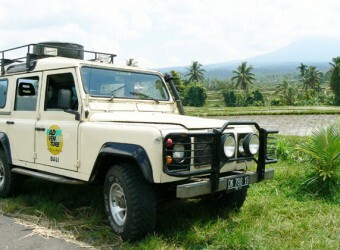 Picking-up by land rover with a logo of Paddy Adventure. Visiting Tanag Lot Temple in the morning is recommended because the air is very clear. You can go to the temple by walking on the rocks in the low tide. Baptism is available by giving offerings. 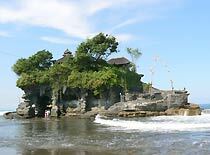 Batu Bolong Temple next to Tanah Lot Temple is also a beautiful place to visit! Visitingh a clay roofing tile factry which is run by a local family. Sticky read brown sand is a material to make the tiles. They use dried coconuts skins as fuel. Carving a traditional design. 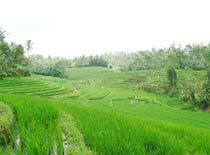 Bali has 3 terms for rice planting. 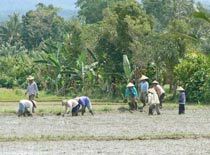 It is not rare to see planting and harvesting rice at the same time. 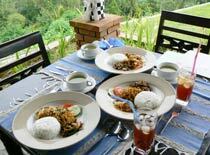 Take a breake one with mineral water and a light meal! Don't forget to bring a camera to take the greatest views! Arriving at restaurant in the open air in the afternoon. You can see the nature view from the restaurant. Lunch is Indonesian buffet. 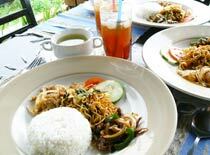 The lunch includes 2 soft drinks or 1 small bottle of beer. Stopping by a local hot spring called Belulang before going back to hotel. How many people can fit in 1 land rover? Can I take photos in the middle of the tour? You can request as many stops as you want at your favorite places! What views can we see in the tour? The land rover goes through jungle, tropical rainforests, and small roads surrounding rice terraces which regular vehicles cannot drives in. Will the tour be cancelled when it rains? It is possible to be held. Lunch buffet including 2 drinks (Coke, Fanta, Coffee, Ice Tea or Mineral Water) or 1 small bottle of beer at restaurant which is owned by Paddy Adventure. It seemed interesting so I joined this tour and it’s not so different from car rental. I could enjoy nature and viewed Balinese people walking with baskets on their heads like I watched on TV.